—A NURSERY owner who has been looking after children for more than 40 years has been recognised in the Queen’s New Year Honours list. —Tina Jones, aged 60, was appointed MBE for services to Childcare and Early Learning in Denbighshire after running Prestatyn’s Tiny Tots nursery for more than 40 years. —Mrs Jones, owner and manager of the nursery based on Meliden Road which opened in October 1972, says ‘thousands’ of children have passed through the nursery over the years and said grand- children of previous atten- dees are now being looked after. —Mrs Jones’ daughter Kirsty works full time at the nursery while daughter Kira, a mobile beauty therapist, also lends a hand at the family-run business. 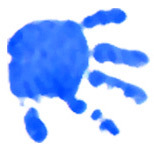 —Mrs Jones has been a National Day Nurseries Association (NDNA) Trustee for more than 20 years and is a quality assessor for the NDNA’s accreditation scheme, E-QC. 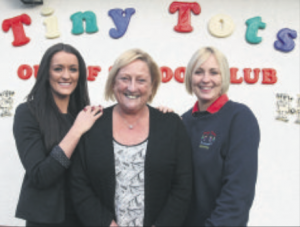 TINY Tots nursery in Prestatyn has been providing quality care to children and babies of all ages for more than 40 years. A Children’s nursery took huge steps to scoop a national prize. 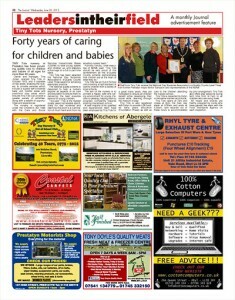 Tiny Tots in Prestatyn received national recognition for the quality of care it offers children. The Meliden Road business was awarded the National Day Nurseries Association’s (NDNA) e-Quality Counts at level three, which indicates it is achieving ‘exemplary practice’. e-Quality Counts is a national quality scheme designed to help a nursery explore all aspects of its care and education to ensure it is delivering the best possible service for young children. For further information about NDNA, call 01484 407066. 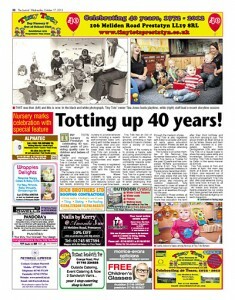 TINY TOTS nursery in Prestatyn is celebrating 40 successful years of providing quality care to children and babies of all ages.